Every so often My Vacation Lady hear a story about clients flying to their vacation or honeymoon destination who find out, in their arrival airport, that their luggage was not on the plane. Yes, travel insurance can help but what can you do to protect yourselves from losing your luggage? 1. Take a picture of each piece of luggage and keep it on your phone or camera until the end of the trip. On our way back from Hawaii a number of years ago, one piece of luggage didn’t arrive in Newark. When I went to report the lost luggage, I couldn’t remember what color it was (it was a long over night flight home). I knew it was a rolling duffle bag with red and white ribbons attached but I couldn’t remember if it was blue and gray or green and beige. A picture would have helped enormously. 2. Make sure that your luggage is tagged to the correct final destination. For example, if you are going to London Heathrow, make sure the airport attendant tags your luggage with LHR. Clients of mine didn’t pay attention to this and their luggage ended up in Stockholm. If you don’t know the airport code for your final destination, ask to see the tags before the airport attendant puts them on and ask which airport code is being used. 3. Buy brightly colored luggage. Will you be able to find your black suitcase among the sea of other black bags on the luggage carousel? The luggage we use most frequently is red or bright royal blue. It’s so much easier to spot. 4. If your luggage is a typical color (black, blue or green), make it stand out so you can spot it from a distance. I use multi colored ribbons tied around each handle. I also use brightly colored luggage straps to wrap around the suitcase. I have distinctive luggage tags so that I can also see those from a distance. I have even seen people mark their suitcases with silver duct tape or other colored tape so that they can spot it from a distance. 5. Make sure your luggage is labeled with your name, address and phone # on it so that in case it is lost, it can be identified. Also, it is a good idea to have the same info on the inside of the bag for the same reason. 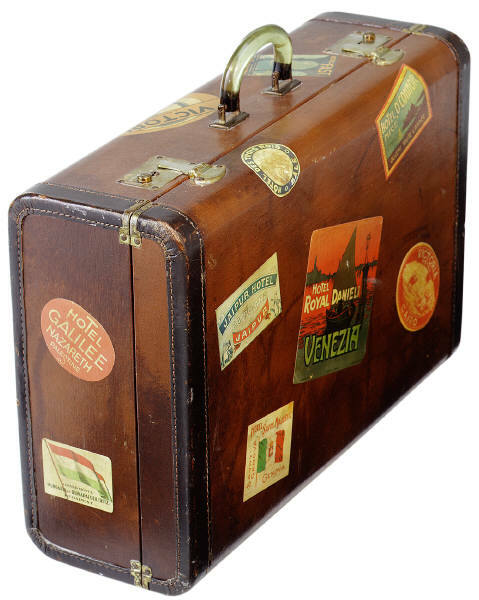 If your luggage is lost, file a claim immediately with the airline, hotel, cruise ship or tour operator. In order to file an insurance claim, you will need some back up info to prove that your luggage was lost. Don’t pack anything valuable like cameras and jewelry. Put those in your carry on luggage. If you need to take medication with you, please put that in your carry on luggage as well. We are aware of what you can and can’t take on the plane with you in terms of liquids so if you need to take liquid medication or even contact lens solution, bring enough in a carry on for a few days, just in case.